Valentine’s Day is approaching and it will be here in no time. Have you planned out a date for your loved one yet? Wait! Here is a tip for all those looking to impress their dates and showing them a good time. And that is to hire a party bus or stretch hummer limo service in Dallas. Are you thinking why hire a limo? Have you ever seen celebs ride in limos and wondered? You must have, after all traveling in a limo is classy, luxurious and stylish to state it simply. And with our reasonably priced limo and party bus rentals, you and date can both feel that luxury and class. You spend a lot of time planning the date, making the reservation and getting ready for the day. Then why would you ever want to waste the precious time you have with your date fighting with the traffic blues. And the best way out of it, is to hire a limo rental, so that you can kick back and enjoy. Our fleet comprises of a widest variety of limos, stretch hummers, and party buses for you to choose from. Whether it is luxury, style, or glamour that you are looking for, you will find it with us. We bet you won’t be disappointed with our rental options, because no one can offer such a huge range to you. All of our chauffeurs are well trained, experienced and follow complete discretion when serving you. So you will have no worries while you enjoy your private moments with your date in the back of a luxurious party bus. Are you one those people who wants to skip restaurants or crowded pubs? Then why not take your party to a limo or party bus instead. After all, partying on the road is one of the most popular and fun trend on the block. Imagine how much fun you’d have hanging out with your date in the back of a limo drinking, eating and chilling. So what are you waiting for! Head on to Dallas Limo and Black Car Service to hire the best party bus service in Dallas, It’s the season of love and you wouldn’t want to disappoint the love of your life. So hurry up and make your bookings before it is too late. Wedding season is finally here and we are sure every bride must be going crazy worrying about finer details. But with proper planning everything is possible. And one of the important things that you should plan for is your wedding transport. Hiring our party bus service in Dallas will help you get the perfect ride. If you are not sure about renting out a party bus, let you tell you why it is super important and how it will make your day more memorable. A party bus or any wedding transport is no more a mere means of getting from one place to another. It is an experience in itself. Imagine hanging out with your girls or family on the way to the wedding. Whether it is emotional support that you need or if you just want to have some major fun before, a party bus is your best bet. With a party bus you can be with all your loves ones at once. We have a wide range of party busses available. You can choose from various limos, vans, and buses. However huge or small your gang is, you will surely find a perfect party bus with us. Nowadays reaching the wedding venue is not just about being on time, it’s so much more. It has to do with style and luxury. Wouldn’t you want to ooze style and luxury when you hit your wedding venue? If yes, then hiring a party bus is the right way to go. When you hire our party bus rental services it is our responsibility to ensure that you and your guests reach the wedding venue on time. In essence you are not only hiring a party bus, you are delegating a responsibility to us. This means one less thing for you to worry about. And don’t worry we are professionals and will make sure you are on time. There are a lot of expenses going on for a wedding to take place. But you don’t need to worry; our party bus rental service is extremely reasonable and cost effective. We will definitely work it out according to your budget. So, do you see it now? It is super fun when you hire a party bus for your wedding. And Dallas Limo and Black Car Service is here to ensure that you get the best service there is. We are experienced in offering party bus, taxi rentals and DFW airport transportation services. So you needn’t worry about anything once you hire us. Hiring Dallas taxi services are one of the most convenient ways of traveling. When you hire a cab, you automatically bid goodbye to the many worries that come with owning a private vehicle. This includes worrying about the fuel, parking, tolls, the effort that goes into driving through the traffic and more. In comparison hiring taxis to drive you to and fro is a much convenient option. One of the most important things to look for in a taxi service provider is their reliability. And our reputation precedes us in the matter. Ask anyone around and they’ll agree that we are the best in business. We have been serving the community for years now and you can always rely on us for being there for you. Now, another thing about taxis is that they should be on time or else it is pointless getting cab in the first place. Well, we understand this and we are always on time. When you rent a cab from us, you will never be late because we never are. All our drivers/ chauffeurs are screened through proper security measures and are trained professionals. They are well equipped to take you to your destination in the quickest and safest way possible. Can you imagine getting any work done when you are behind the wheel? No, right! Well when you hire our taxi service, you are free to tend to your business while we drive you around. You can make important calls, answer emails or even work on that presentation. Next reason as to why you should hire our services is cost. We offer extremely competitive prices that you won’t get anywhere else. No one wants to travel in a battered down car which is not in proper condition. Since all out cabs are in the perfect condition, all the time, you won’t have any trouble traveling in our cabs. All are cabs come well equipped with GPS networks, AC’s, music, interiors and more. The Dallas Limo and Black Car Service is a premium provider of taxi services and more. Next time you want to hire a taxi or a Dallas party bus, do comb through their fleet of cars. And always remember to choose a reliable as well as reputable taxi company to ensure your safety. Are you hiring a party bus in Dallas TX? Planning a party? Well, hiring a party bus and having fun with your family, friends and other loved ones is definitely an exciting way to rock a party. 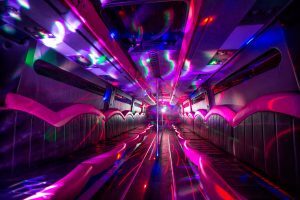 The idea of hanging out in a party bus, having fun all night is what has made party bus rentals such a popular affair. But wait! While it is popular and exciting, there is also the need to proceed with caution. The first and the most important thing is don’t ever hire a rental bus from a company without doing due diligence. Always ensure that everything about the company i.e. its insurance, its licensing, its safety and inspection record etc. all are in place. Also don’t forget to check from service history from previous users. Next thing on the list of don’ts on party bus rentals is- underage drinking. This is a strict no- no and must be avoided at all costs. It is completely against the law and the chaperone must ensure that nothing of this sort transpires on the bus. Then come- illegal substances and/ or weapons. Many people feel the need to do substances when partying, but it is a strict, strict don’t. Do not at any cost bring illegal substances or weapons on a party bus rental. Not only is it again- ILLEGAL, but if things go awry having these items can escalate things to a whole new level. Alcohol can make you go rowdy on the bus. And while having a gala time dancing, cracking jokes etc are all part of the fun, what isn’t part of the fun is putting on antics/ behavior that will distract the driver. So, don’t distract the driver, let him concentrate on driving you around while you have fun. Most, if not all party bus rentals have a strict no smoking policy. So don’t smoke on the party bus, or else it might be considered breach of contract and the driver can terminate the trip. What’s worse is that you can also lose out on the deposit in addition to the rental fee. Well, the next time you hire a party vans service in Dallas TX do check out the wide range of options available at the Dallas Limo and Black Car Service. And we are sure that you will keep these don’ts in mind. Just follow them and your night out with friends, family, colleagues is going to be a glowing affair.